Team Dynamics is; When a team’s natural energy is balanced effective results and flow are achieved. Be it your executive group, operational team, or around the board room, maximising results is about maximising each individual’s contribution. Any company that focuses on increasing its growth opportunities, should commit to consciously understanding what this as a whole means, bringing into balance the natural energy of your board, team and their key functions. 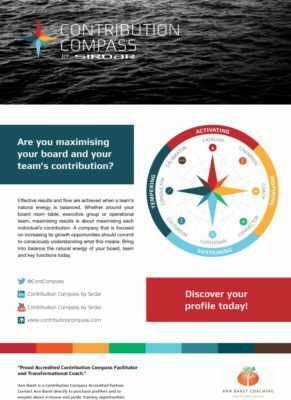 Download the Contribution Compass PDF guide to Unlocking the full potential of your team! Team Dynamics will help you to understand the various roles and accountabilities for each member of a team, and highlight how those differ for each individual. Team Dynamics is proud to be an accredited facilitator of the Contribution Compass profiling tool. This means that you can have confidence in knowing that all of our materials and programs are part of the Contribution Compass. Our unique business development system empowers a corporation to grow its profit and productivity dramatically. It does this by enabling you to understand both your area of maximising contribution to a team, company or organisation and how you can leverage the most value for yourself and for your organisation. We believe that it is every person’s right and responsibility to invest your time in your area of maximum contribution, through what is referred to as your ‘natural energy’. Your natural energy reflects the way that you naturally think and operate. It is most easily observed in critical moments, when you will always respond based on your natural energy. A critical or defining moment is usually a brief and intense pressure or turning point, in which the decision you make or the action you take, dramatically impacts your journey, either positively or negatively. By default, you will respond in that moment from your natural energy as your instinct kicks in. Identifying, creating and sustaining your value, which you then leverage, is the cornerstone of working effectively with your natural energy. It requires that you have a deep understanding of your natural energy and that you actively seek to utilise that natural energy to create, build and deliver value – for yourself and others. Maximising a company’s growth potential, and its contribution to society, occurs in an environment where a team of loyal and supportive people with the appropriate energies and skills collaborate to achieve the business’ purpose. This tool aims to provide you with focus on how to maximise your own application of skills, expertise and time and how best to play your most valuable role in a team. Furthermore, this tool supports a board, executive committee or team to maximise its collective contribution and therefore maximise financial and non-financial return. FLOW is the natural effortless unfolding of our lives in a way that moves us towards wholeness and harmony. When we are in ﬂow, occurrences seem to naturally line up, events fall into place, teams work seamlessly together and obstacles melt away. Trust is a measure of how much value you bring to the table. If your consumers trust your company and your staff trust each other, you will always have a place in the market: the higher the trust, the more sales you make, i.e. revenue. Give purpose and value to every individual in the team, have them waking up wondering how they can get better results from each other, without any push from management. Understand your teams strengths and position them correctly – increase the trust and ﬂow in your leaders and teams to TURBO-CHARGE them to work on overdrive… and LOVE it. Get them to do the work they want to do and they will do it with incredible efficiency.